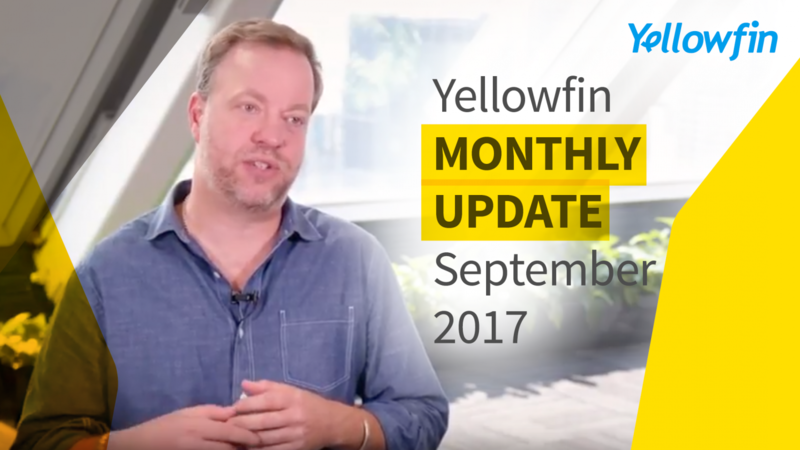 We’ve spent much of September looking forward at what the future holds for Yellowfin. In addition to some great events and travel, we saw success in the analyst community as we prepare for the launch of Yellowfin 7.4. The month began in Japan where we had a big event with our partners and customers (and some of the best Sushi ever). At this event we bought together about 500 of our best partners and customers from the Japanese market. I always enjoy meeting our partners and customers in Japan, and this event was no exception. There were some fantastic announcements from partners – like our launch with NTT Data into the Chinese market. On the other end of the spectrum, we also saw five really powerful case studies presented to the group, showcasing how Yellowfin has been deployed in some of Japan’s largest organizations. Japan continues to be a very strong market for us, and on the back of events like this we’re confident that it’s going to continue as one of our big growth drivers for years to come. We were also excited this month to be included in the Forrester Wave for BI vendors. The Forrester research looks at how BI vendors in the enterprise space are performing. Their approach is grounded in capability, which is quite different to other analyst firms in the market. They look at what problems a platform is solving, what solution they deliver, and how they’re delivering it. It’s a good study for practically helping people decide which BI vendors may be most appropriate for them. We took Forrester through our approach to problem-solving – what markets we are addressing, how we’re addressing them, and our technology stack – and Yellowfin did extraordinarily well in their evaluation. They benchmarked us against our competitors and put us in the same segment as platforms like Tableau. It’s good to see that we’re in a leadership position – especially prior to the release of 7.4 which is chock full of new features. Even though those features weren’t included in the stack reviewed, the feedback we received confirmed that we’re heading in the right direction. We’ve also spent time briefing several other analysts about the impending release of 7.4 this month. It’s always important to show the analyst community what we’re doing and how we’re doing it. But it also gave us the opportunity to have a two-way conversation with the analysts and hear their thoughts on where they believe the market is going and what they think we should be focusing on. The feedback we received was remarkable. Many analysts felt that we’ve got the workflows right for our assisted insights and commented that we are leading the market in thinking about automated analytics. This is great to hear, but it’s also a good opportunity for us to stand back and really understand “where to” next. By seeing where our product stands today in comparison to where the market is going, we’re now well-placed to frame what we should be thinking about in the next year. Yellowfin is now in full release mode for 7.4, which launches at the end of October. We’ve already given some customers and prospects an early look and the feedback has been overwhelmingly positive. In fact, we’ve already seen the enhanced capability from 7.4 bring two substantial new deals to us. These are big deals with companies who are really struggling with BI. They want to achieve better user adoption and need insights to reach their people faster. Their reaction to our augmented data discovery capabilities has been great. When we demonstrate how the platform works and they see just how intuitive it is, they start to wonder why other products can’t do this. And once you actually start using the product it’s hard to imagine doing analytics any other way. One of the deals I got most excited about this month was our deployment at University of York. The University has a unique use case – they’re using Yellowfin to track the long term efficacy of their student’s education. The aim is to monitor the behavior of their students over a four-year course and understand what skills they have upon completion. They can then see how this translates into employability and long-term performance. It’s a fascinating piece of work that we’ll watch with interest once fully deployed. All in all, September has been a great month that sets us up for the rest of this year and the launch of Yellowfin 7.4. We’re all hands on deck and looking forward to another strong quarter to close out 2017.